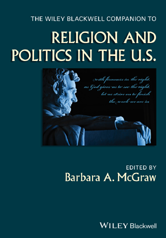 Wiley Blackwell Companions to Religion: The Wiley Blackwell Companion to Religion and Politics in the U.S.
CHAPTER 5: Were Any of the Founders Deists? But Were Even a Handful of Founders Deists? At Century’s End: A Political Theology or Theological Political Theory? A Clash of Civilizations at the Dawn of a New Century? Future Scenarios: Toward a Global Ecological Civil Religion?